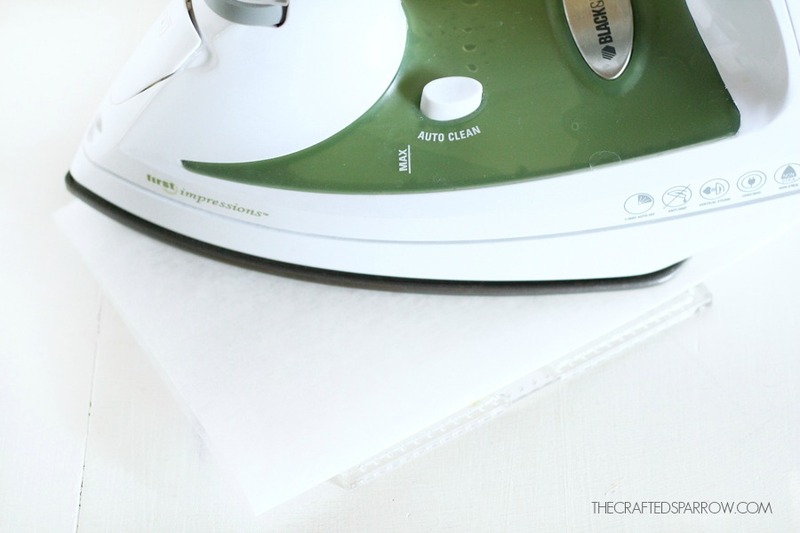 I know the kids are back in school but if you are like me you are still looking for some fun weekend activities to keep them busy during down time. We recently purchased a large amount of perler beads, I’m not sure why we hadn’t ever bought them before because these things have kept my boys busy for hours so far. I had to join in the fun and create some things for myself while they were busy creating. 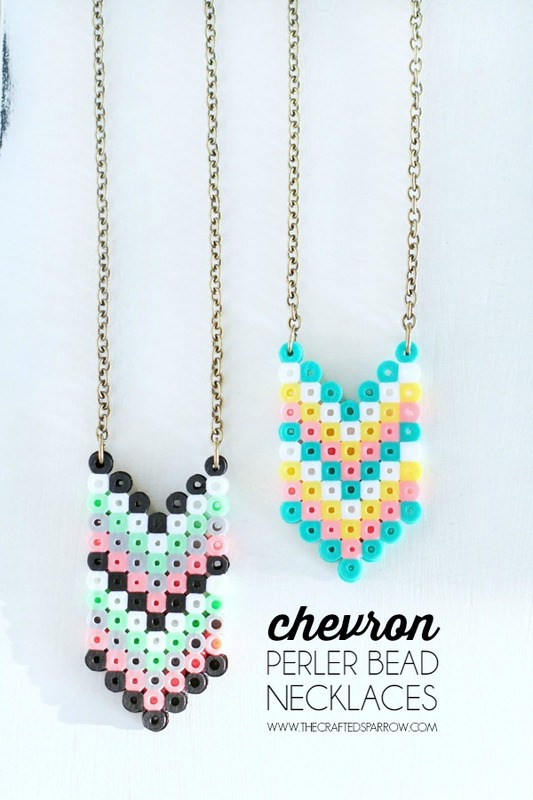 These Chevron Perler Bead Necklaces were so easy to make. 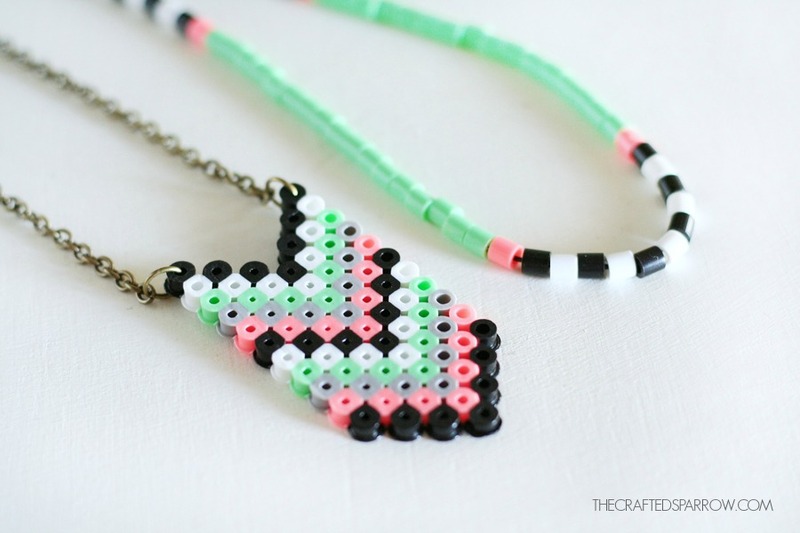 These Chevron Perler Bead Necklaces are also part of the 10th Blog Hop, which I’m super excited to be part of. 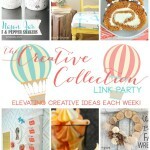 I’m sure you’ve seen this blog hop all over Pinterest. 10 awesome bloggers bringing you 10 awesome projects and ideas on the 10th of every month with a new theme. This months theme is Just for Kids. Be sure to check out (and pin!) 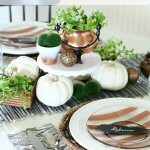 all the amazing ideas from my blogging friends after you check out this easy project. Start by choosing a simple color palette. I think picking no more than four colors works perfect. 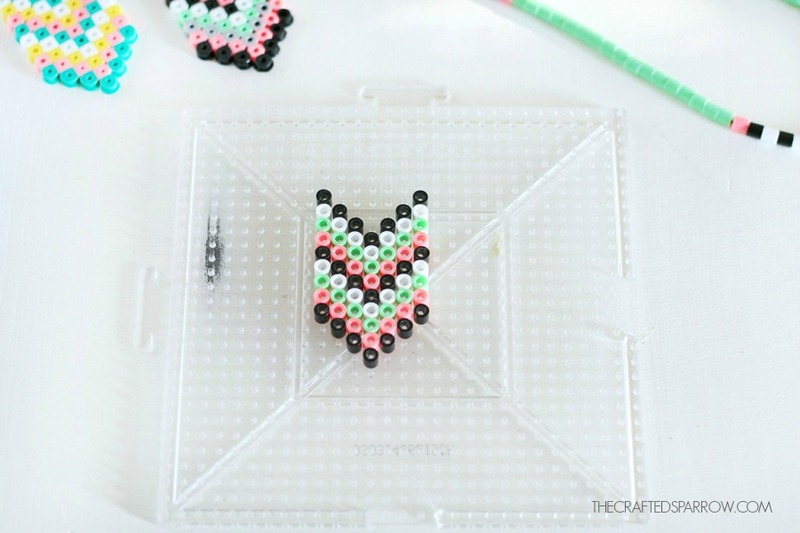 Follow a simple chevron pattern on your perler bead board. I usually repeat my first color three times, so I start and end with it. 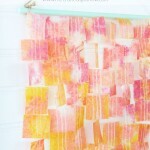 Once you’re happy with your pattern and color choices place a piece of wax paper over top. 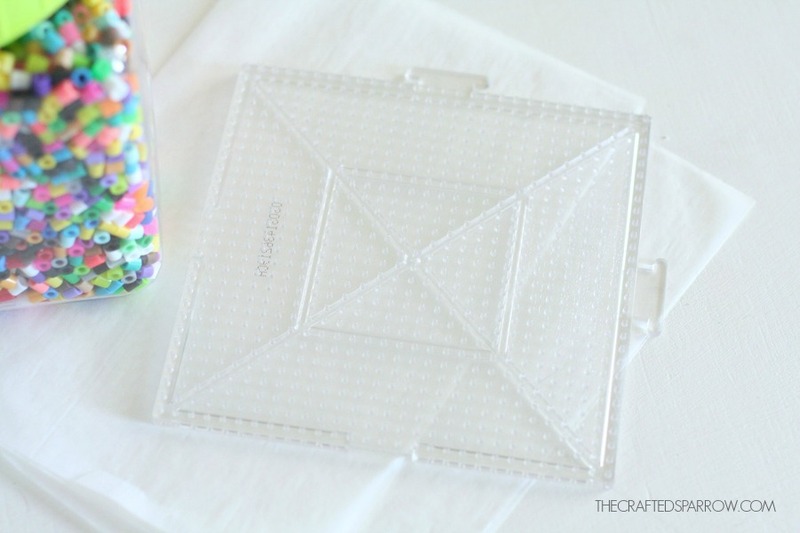 Using a medium heat iron with no steam gently press over perler bead design. Moving slowly until beads are melted slightly together. 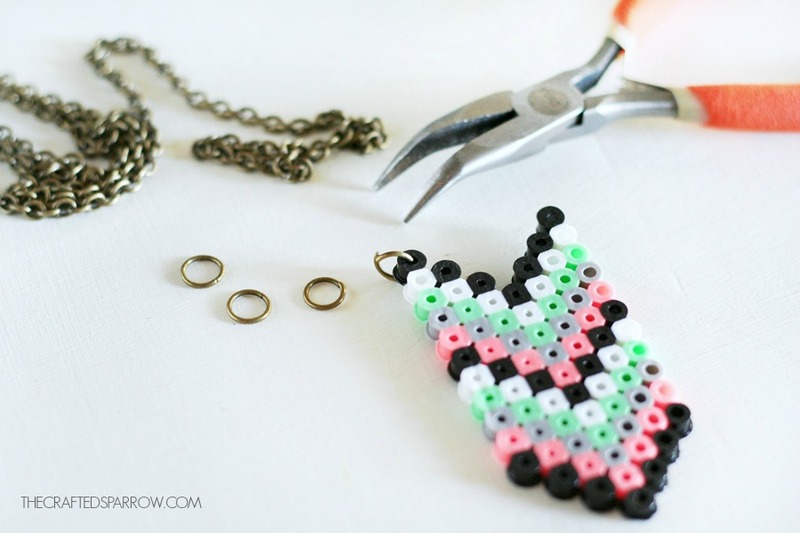 Using jewelry pliers attach your length of chain to each end of the chevron perler bead charm with large jumprings. 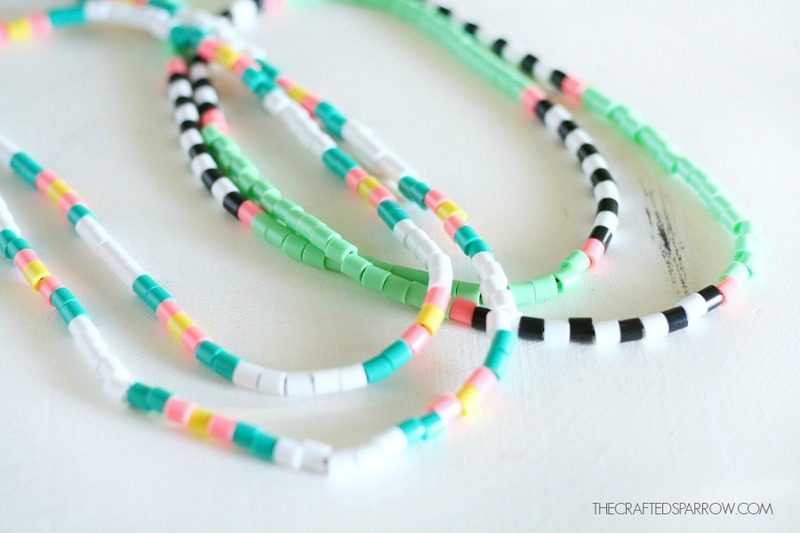 Now if you’re looking for a Perler Bead Necklace idea that doesn’t involve the iron, this idea is easy and super cute. 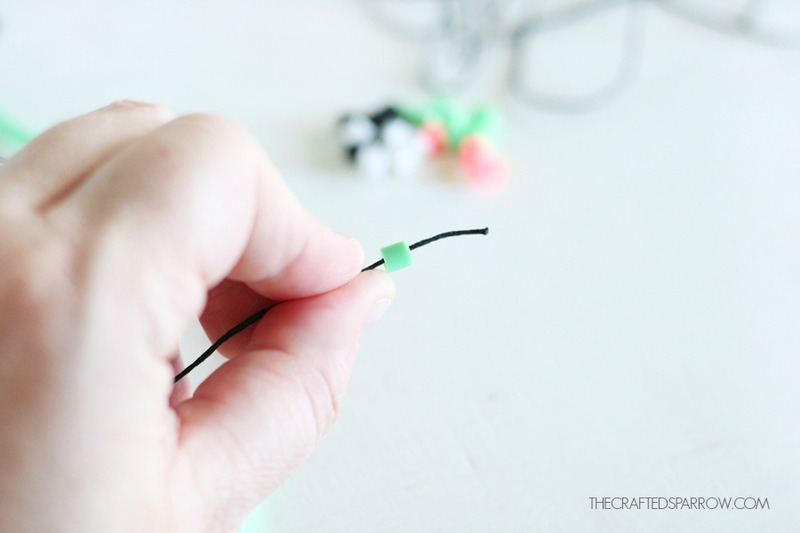 For these simple perler necklaces I used a beading cord I had on hand. 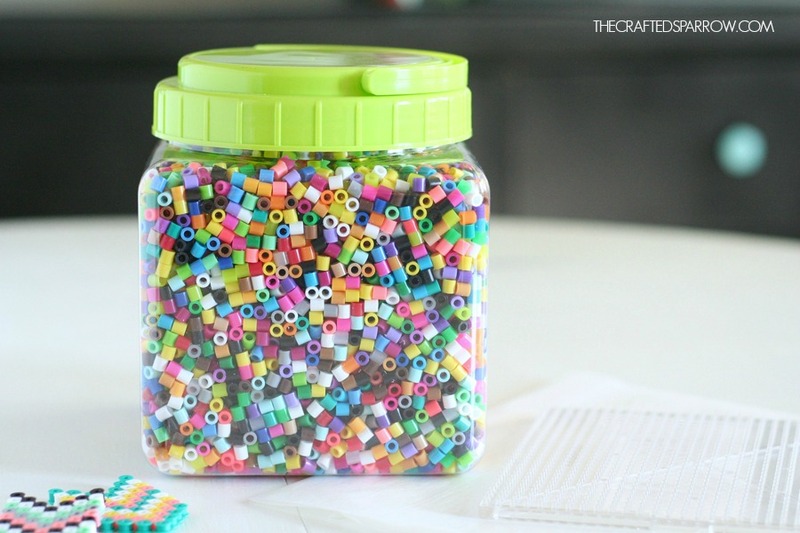 Just string your selection of perler beads on the cord in whatever pattern you want. 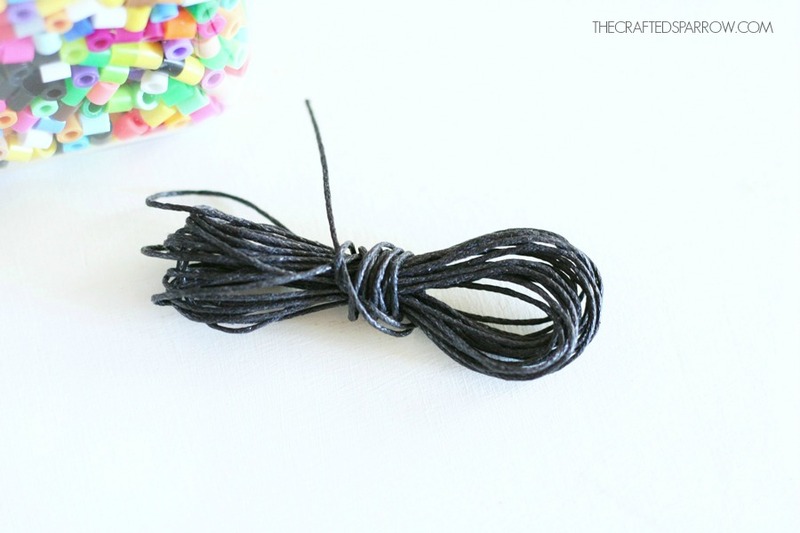 When you are done stringing the perler beads just tie a nice knot at the end. 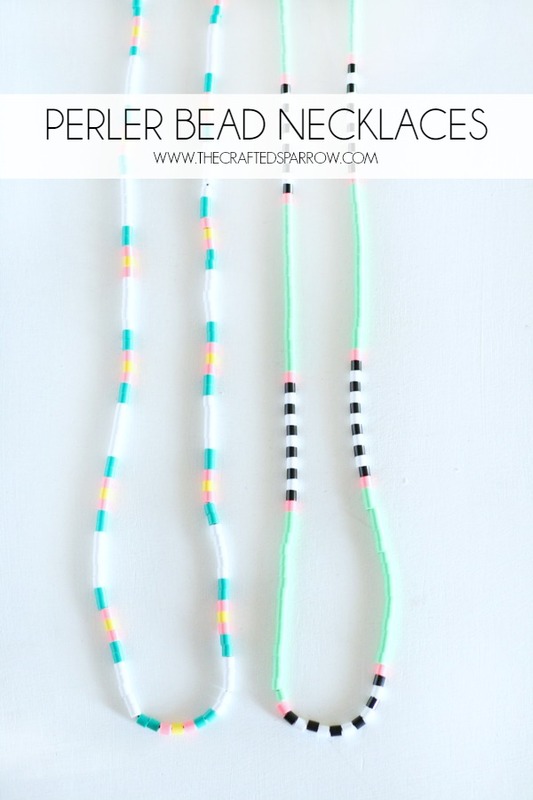 That’s it, perler bead necklaces two ways and both are super simple. 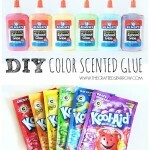 If you are a mom of girls this would be a fun craft night activity. 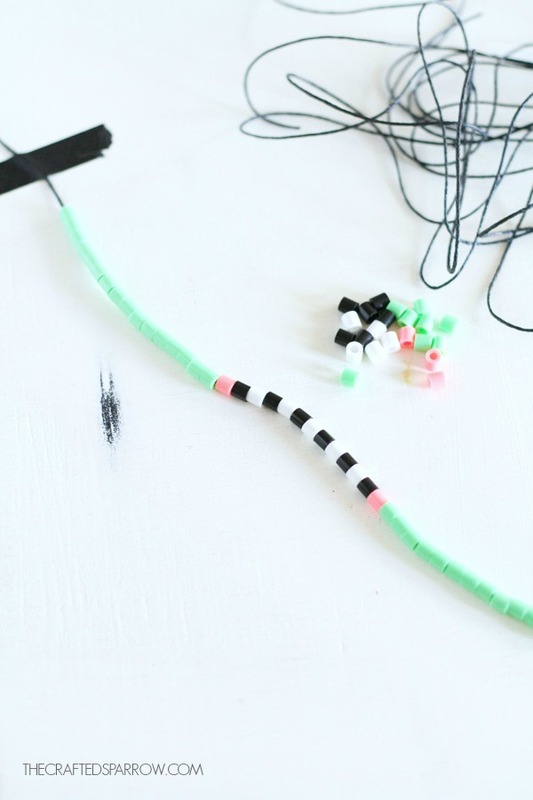 Who doesn’t love inexpensive custom accessories?! Now on to the rest of the fun and amazing ideas. I love these Rebecca!! 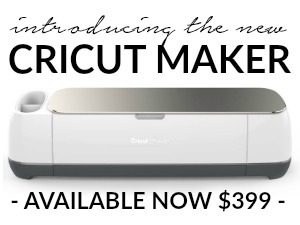 The designs are perfect! Pinning! Thanks Nicki, I know she’ll love them. Who would have thought I’d be in love with these beaded necklaces from like 3rd grade! Perfect. Oh yay, aren’t they awesome. They are super fun to make too! 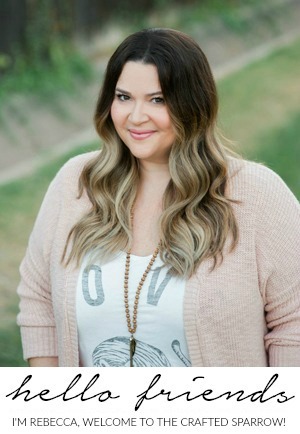 OH my goodness Becca! 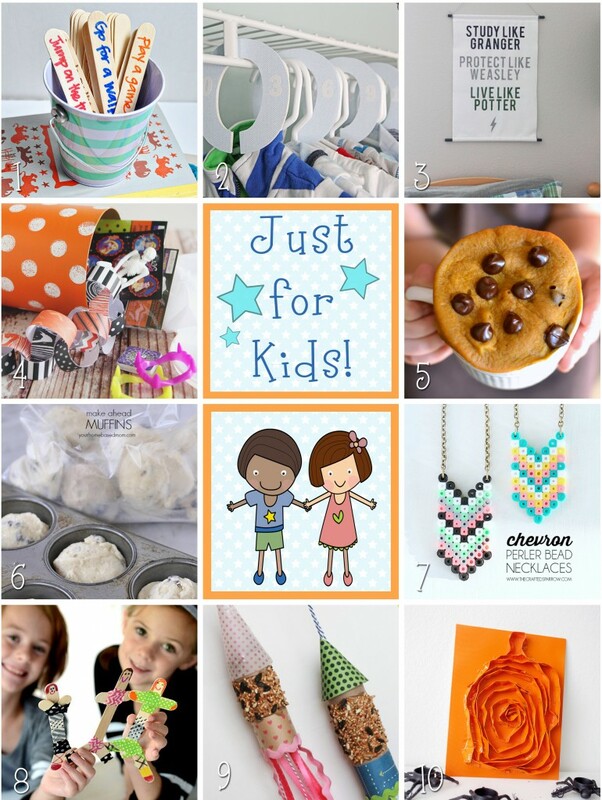 These are darling….pinning ASAP because my girls will be all over this. 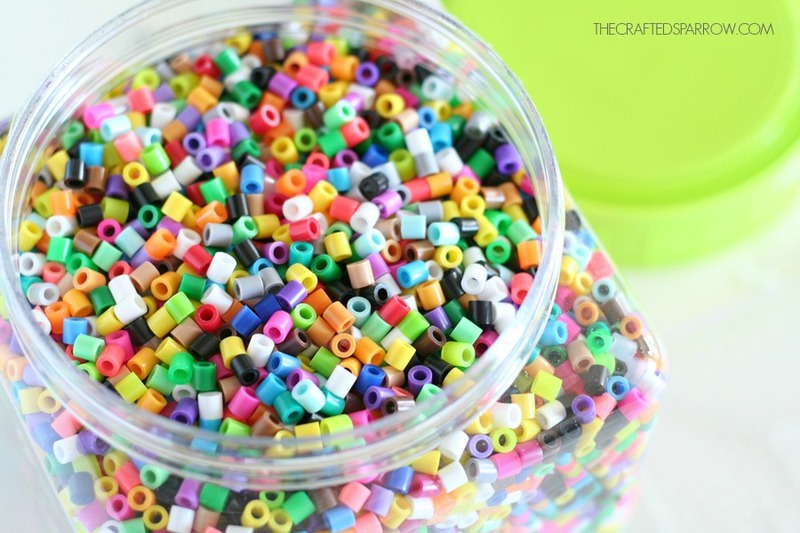 We’re a little bit obsessed with perler beads around here! These are AWESOME! My little girls would LOVE to make them. Pinned! Thanks Mariel. They are super fun to make! 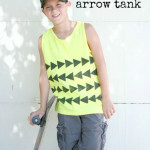 My daughter is going to LOVE this idea!! Thank you so much. Have a great week. 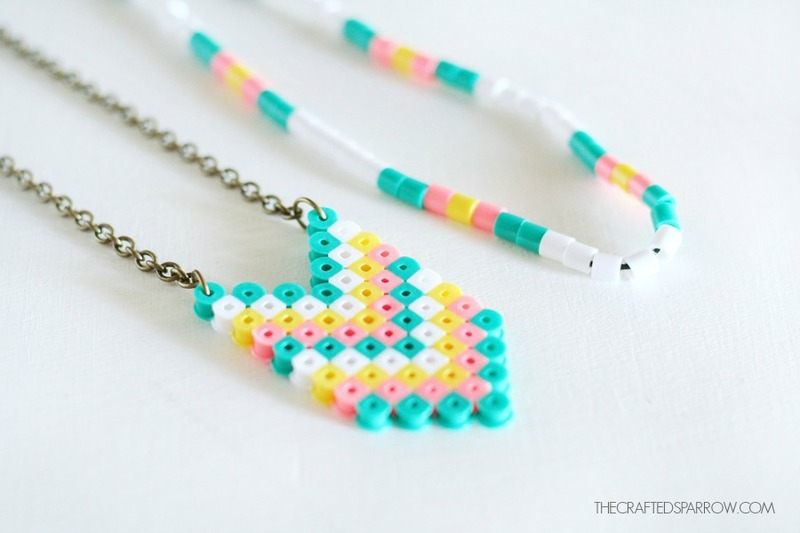 Love the pastel chevron colors! So pretty. Thanks Michelle! 🙂 Have a great week.